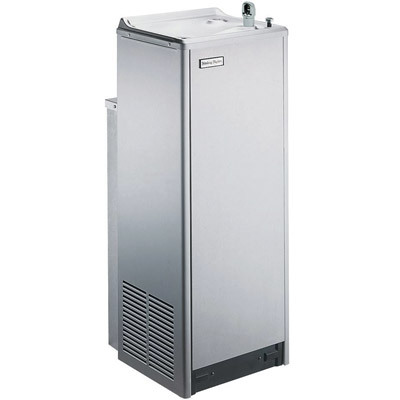 The Halsey Taylor HOF14A-FR-Q Water Cooler is an electric, refrigerated free-standing unit made for outdoor use. Delivers 13.5 GPH of 50°F water at 90°F ambient and 80°F inlet water. Fountain has stainless steel basin with removable drain strainer. Bubbler is vandal-resistant type. Separate valve and automatic stream regulator can be mounted within cabinet. Refrigeration system employs high efficiency, positive start compressor using R134A, non-pressurized tank with totally encapsulated insulation and be controlled by positive sensing thermostat. Unit is certified to NSF/ANSI 61 and meets requirements of the Safe Drinking Water Act. Unit complies with ARI Standard 1010. Stainless steel panels resists wear and corrosion. Durable satin finish helps hide water spots and fingerprints. Vandal-resistant projector is one-piece, chromeplated. Unit has integral hood guard design to prevent contamination from other users, airborne deposits and tampering. Note: As per the manufacturer's policy, adding Frost Resistant units are non-returnable.